If the negotiations come to fruition, Amazon will also launch a targeted website for Israeli consumers, these people said, adding that Amazon is interested in leasing a minimum 270,000 square feet of warehouses (25,000 square meters) and is more likely to prefer a location near the city of Modi'in, 22 miles (35 kilometers) southeast of Tel Aviv. As part of its entry into the Israeli market, Amazon has set up a team of both locals and non-Israelis, which are currently meeting local distribution and delivery, and logistics companies, these people said. The meetings are intended to provide Amazon with insights into the shopping habits of Israeli consumers, the local standards of service and the local logistics and distribution infrastructure. At the same time, people affiliated with the company are working with real estate agents to choose an optimal site for the warehouses. Currently, Amazon's deliveries to Israel are supplied mainly through shipping centers in Germany, the U.K., and the U.S. The company also has sales and delivery outposts in other European countries like Italy and Spain. This operational structure leads to high shipping and delivery fees that in turn inflate the prices of the products and also increases delivery times to the country, which can currently take up to a few weeks. 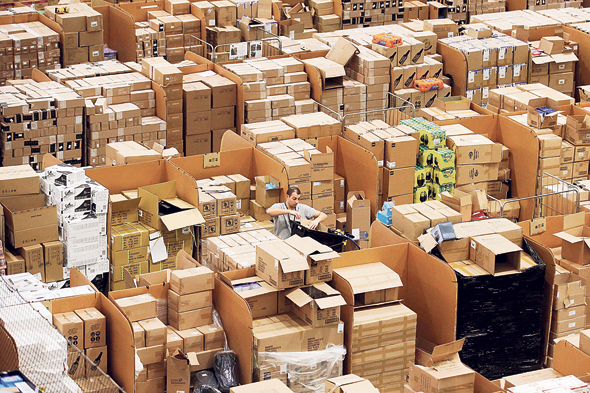 If realized, the new warehouses have the potential to lower Amazon’s prices for the Israeli consumer and drastically reduce the company’s delivery times. Amazon’s shipping centers in the U.S. enable the company to promise same-day delivery or even delivery times of 3-4 hours in urban centers. The high domestic prices in Israel, compared to the average in OECD countries, have motivated many Israelis to conduct an increasing portion of their purchases online. In 2015 Israelis were the third largest per-capita online international consumers, according to OECD data. According to Paypal data, in 2016 Israeli consumers spent $3.36 billion on online shopping, and this year they are predicted to spend $4 billion, a year-to-year increase of 18%. Online retail is often cheaper than the prices seen in local stores, especially for products like clothing, footwear, cellular devices, gadgets, and cosmetics. But prices are driven up by the shipping costs, and also by local taxes. Israel grants value-added tax exemptions for purchases of up to $75, and an import tax exemption for products worth up to $500. In the last months, the Israeli government has been under increasing pressure from consumer organizations, the Israeli Postal Service and non-Israeli online retail companies, all calling for a higher tax exemption ceiling. The prevailing argument is that the increase will benefit Israeli consumers and help lower the country’s high living costs. On the opposite corner stand the Israeli Tax Authority, the Israeli Chamber of Commerce, and retailers and shopping center owners, who are claiming that online retail is hurting their bottom line and suggesting taxation inequality. The Chamber of Commerce is also arguing that raising the ceiling will lead to shops closing and tens of thousands of employees being laid off. Amazon’s entrance into the Israeli market, if realized, will have a dramatic impact on the local retailers. Traditional retailers are already feeling the effect of consumer foray into online shopping. If Amazon establishes a local presence it might accelerate the phenomenon. The shockwaves will be felt in the entire retail industry, from electronics to cosmetics to DIY. As for the food industry, it seems that at least initially Amazon does not intend to offer foodstuff as part of its planned Israeli push. In October Amazon announced the opening of two Alexa shopping research and development centers in Israel, confirming earlier Calcalist reports. The new offices will be located in the northern port city of Haifa, one of Israel's biggest technology hubs, and in 270,000 square foot of the Azrieli Sarona office tower in Tel Aviv, set to open in 2018. Amazon has been present in Israel since 2013 when it bought Israeli communications chip designer Annapurna Labs. In reply to a request for comment, an Amazon spokeswoman said the company does not comment on rumors and speculation.